In the Spring of 1992, Brooke Gehman took a field trip with his art college art class to a small town nestled in the Southeast Corner of Kansas called Elk Falls. There, he met master potters, Steve & Jane Fry. He lived with them for a portion of that Summer and fell in love with the Fry's, with Elk Falls and with Clay and the Pottery-Making process. In April of 1993, Brooke & Dana married and moved to Elk Falls where they spent the next 4 years apprenticing with the Fry's. The Pottery-Making process has become such a picture to us of the redemptive story of God. He created the Universe with a word...but when it came to His most cherished creation, humankind, He got His hands dirty and formed the Man from the dust of the ground. The very first Potter showed His ability to take something that most people would view as worthless and make something breath-takingly beautiful. In making pottery, we reflect the character of our Potter in taking lifeless, worthless clay and making works of art. 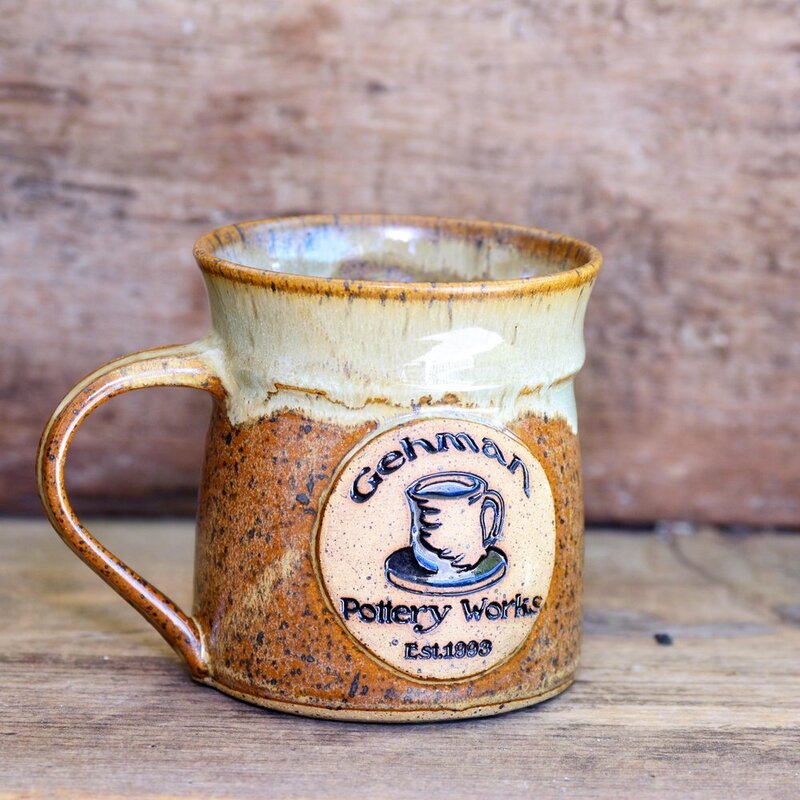 Each peice of Gehman Pottery is handled with much care and detail. No two peices are exactly alike. Check out this blog post from a good friend and fellow artist who captured so well the spirit of why we do what we do. Click Here! Each piece of our pottery is a hand-made and unique one-of-a-kind work of art. Form and functionality are the key to our works of art. Some pottery is made for the purpose of sitting on a shelf to enjoy the beauty of the form. At Gehman Pottery Works, we believe that functionality does not negate the beauty of the vessel but enhances it. Our mugs and kitchen ware become very personal and valued additions to the homes of our customers. If you live within driving distance of Adams, Tennessee...why don't you plan on making a trip to see our wares in person! A picture may be worth a thousand words, but actually holding one of our mugs or other pieces in your hands will help you decide which one you can't live without! You can personalize and customize any of our items for the perfect gift that says, "I care enough to get you something you can't find in any other store!" From the time he was very young, Brooke loved art and creativity. For years he dreamed of working for Disney or illustrating books, but at the age of 19 he discovered clay and fell in love. The picture of seemingly worthless dirt being transformed into something of beauty is a theme in Brooke's life. Redemption. Restoration. Beauty from ashes. Dana is not artistic, but is full of great ideas that Brooke is able to make happen. Together, they make a dynamic duo. After promising herself she'd never marry a weird artist, she found a non-weirdo artistic genius and made beautiful pots and babies with him. Creativity runs deep in this family. Each of the Gehman children help stir the creative juices in their parents and are also learning a few tricks of the trade themselves. Look out world...here they come! Brooke learned how to throw from the one and only Steve Fry of Elk Falls Pottery. Dana is one of the greatest packing geniuses of all time. She knows how to utilize every inch of space whether packing for a long family trip, or a kiln full of pots. Check out our new friends' music! Click on the picture to find their music and some pretty cool mugs as well! Our hand-sculpted face mugs are a big hit with our customers. Each one has a unique personality...though you can tell they are all related. We can add your logo or design to any mug or other pottery piece. Add creativity to the functionality of your kitchen with our sugar and creamer sets, canisters, honey pots and more! Everyone's favorite halflings would be happy, indeed, with this hefty tankard that holds around 20 0z. of your favorite cold or hot brew! Our mugs come in many shapes and sizes and a variety of colors! Want to set your business apart from all the rest? Get custom hand-crafted mugs with your business logo embossed on the front!